On July 18, 1964, a flight of four Massachusetts Air National Guard F-86 Sabre jets were returning to Barnes Airport after a gunnery training mission. 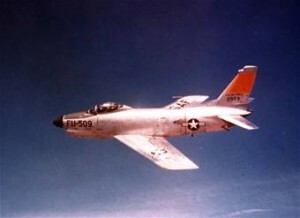 One of the Sabre’s was piloted by Captain John H. Paris, 33, of Newburgh, New York. As the jets approached the airfield, Paris’s aircraft suddenly lost power and dropped out of formation. Captain Paris ejected, but his parachute failed to open. He fell into Pequot Pond and was killed. Meanwhile, his F-86 came regained level flight and belly land on its own in an open field about 2 miles northeast of the north end of Runway 20 at Barnes Airport; about 700 feet east of Ross Road. The aircraft sustained major damage but there was no fire. Captain Paris was part of the 131st Fighter Squadron. Larry Webster, Aviation Historian, Charlestown, R.I.